Parking in downtown Columbus can be a challenging endeavor, not to mention quite costly. Park & Pedal lets you skip the high costs and hassle of competing for downtown parking. Simply park your car for FREE at any one of the Park & Pedal locations surrounding downtown and enjoy your short bike ride into work. Academy Park: 36 parking spaces available. Easy access from I-70 on Columbus’ east side. Bike into downtown on bike-friendly roads, such as Bryden Rd/Town St, or Oak St. Dodge Park: 13 parking spaces available. Easy access from SR-315, I-70, and I-71 (just off the Rich St. exit of SR-315, one exit north of the I-70/I-71 split). Bike into downtown on the Scioto Trail, a Central Ohio Greenway. Scioto Audubon: 12 parking spaces available. CoGo station located on site. Easy access from I-70 (Front St. exit) and I-71 (Greenlawn exit). Bike into downtown on bike-friendly Front St.
Don’t have a way to transport your bike to a Park & Pedal lot? CoGo’s got you covered! Rent a CoGo bike and make the easy ride into downtown. Please submit any questions or feedback regarding the Park & Pedal program to gohio@morpc.org. 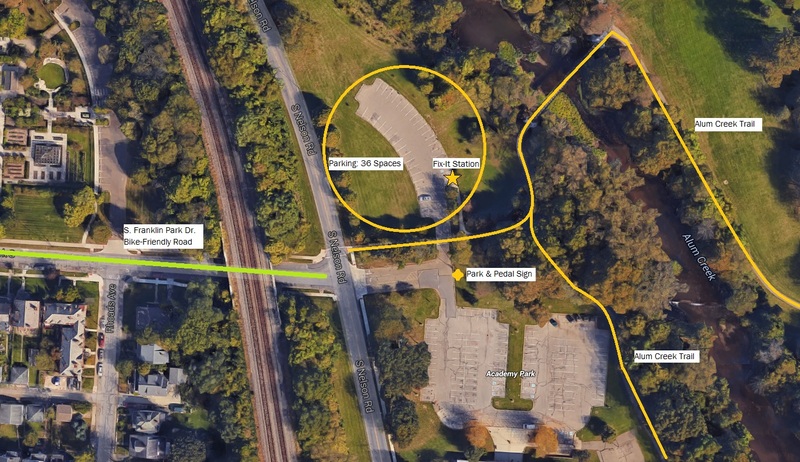 We're continuously looking to add Park & Pedal locations. Have any suggestions of what might be a good lot? Let us know by emailing gohio@morpc.org.